Hi There! Following you now:) I found your blog through my nightly blogstalking. I am always so happy to see quality posts from upper elementary bloggers! Now, I have a little song for you..."Walk Walk Walk, Walk in their shoes!" Do you use the new version of second step? If so, this has already been stuck in your head! We use the program and have for years. I was so happy that our district upgraded to the new digital version. The songs and lessons are great! 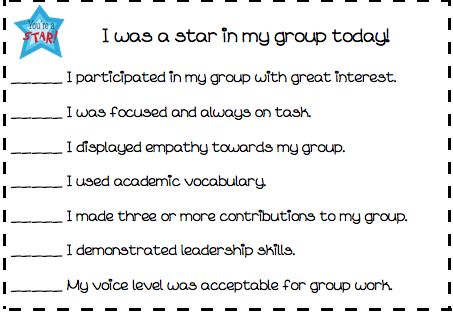 Anyway, have you tried to target one aspect of group work like "doing your part" and talking to the kids about what each level (on a 1-4 scale) would be? Target whatever part of group work that gives them the most trouble. What does a "1" look like? Not paying attention to what your job is. Not writing the things down that the others in the group are...etc. Talk about each level and so on until you get to the exact behavior you expect at the "4". They could write a 1-4 on the line of your rubric. This is what I do to really make a big deal out of the behavior. We make an anchor chart to display and check in a few times during each group activity. Thanks for stopping by and following us! I loved your comment and it made me laugh because I know exactly what you are talking about with Second Step. We are currently on the, “Stop, name your feeling, calm down!” unit. I’d like teaching Second Step more if my students actually applied the strategies being taught to actual situations in their everyday life! The funnier part is that some of my students are actually afraid of the music video for this unit. There is a very fake and animated talking brain and it actually made a girl sick and go to the nurse. Now she is scared of Second Step. 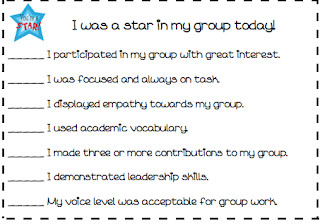 What a great idea about creating an anchor rubric. We have done the, “This is what a “1” looks like” many times for open ended responses, writing prompts, and other academic procedures, but I never considered it for behavior besides voice levels. Love it and will have to try it! Thanks again for the comment and don’t be a stranger around here!